I’ve always found character customisation in video games to be one of the most important aspects to an immersive, personalised virtual experience. It’s a declaration of putting yourself in the shoes the game has given you, replacing the protagonists’ name with your own, or any name you want. Not every story is suited to this, but it’s a side of video games I’ve definitely grown to love. I always use the opportunity to make an idealised version of myself. Straighter nose, stronger jaw, wider mouth and fuller lips. I keep the freckles, I’ve been told they’re cute. Usually add a scar or two for that final touch of gritty confidence. 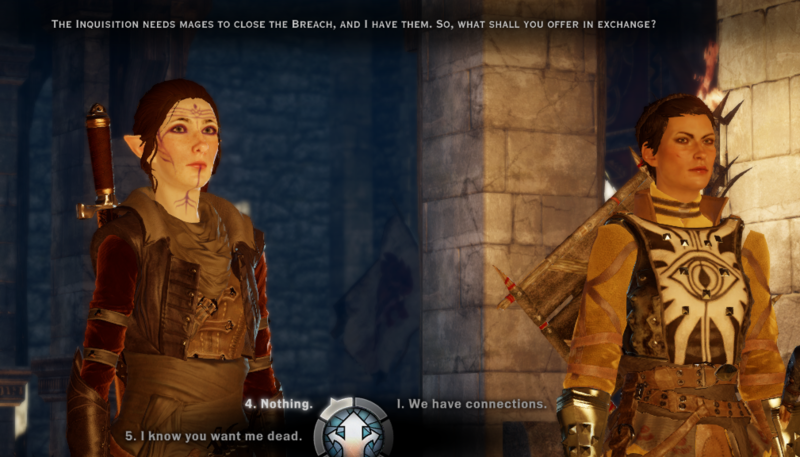 This time, on Dragon Age: Inquisition, I made more of an effort to make it look like the real me. I even held a mirror up as I adjusted each feature, trying to get it looking exactly right. I thought it would be a lesson in self-love, to play as who I am instead of who I want to be. There’s limits to the engine, including plenty of tiny details on its face that don’t look like mine, and can’t be manipulated to be. The muscles beneath my skin move differently to the way the muscles of this model. I pull different expressions to the ones animated. As the character grimaced and sighed and smirked her way through the intro, I winced and kept having to check the mirror. My face doesn’t really look like that from those angles, does it? No. I needed constant reassurance. I realised I’d gotten some things wrong–too many freckles, skin too blotchy, I’d made my mouth too small, set it too far back on the face, it doesn’t have my dimples or imitate the way my smile creates creases in my face. While it looked fine when she didn’t speak or move, at other times the cheeks would clip behind the teeth garishly, looking as if the skeleton was trying to eat its way out of the skin. It was all rather uncanny valley. I tried to convince myself that those errors made it less like me, that I’m prettier, cuter, totally different. Yet I still feel deeply uncomfortable playing through this avatar, my gut gnawing at me with the phrase that’s been a constant companion for my entire adult/adolescent life: not good enough. It feels completely at odds with the way the characters compliment my avatar and raise her up to the status of a religious and political icon. Noticing how often that phrase has been rattling through my head as I play through the game has told me how truly important it was for myself to try this out. It is so easy to like the person you want to be. It is easy to escape into that idea and take joy in it, telling yourself that maybe one day, you’ll be this strong and assertive and admired, this relaxed as you talk to others. The whole world is easier when your life’s a story with an ending that favours the hero. But while it’s still important to have these games to escape into when life is a little too tough, I have been feeling more and more that I am missing the stories that embrace imperfection. I miss narratives that acknowledge the normalcy and insignificance of our own selves, that don’t raise any one person above others, but help us navigate ideas of worthlessness within a crowd without drowning or catapulting us into the upper atmosphere without a parachute. I made my avatar but her feet don’t fit in the journey this game had planned out for me. This isn’t a criticism of the game; I’m completely addicted and have sunk hours into it. The choices I made at the very beginning just forced me to confront some real-world issues just as I tried to escape them. I’m sick of changing the angles that I view my face at and practising expressions in the mirror, customising my presentation towards the world so that it only sees the ideal, hero version of me. Well–okay, I probably won’t stop with the selfies or the faces in the mirror, but I might stop looking up plastic surgery every time I compare my face to someone else’s. I’ve already moved past the customisation screen and it’s too late to start again; I’m stuck with this, and that has to be okay. That has to be what gets me through the game of life, get the romantic interest, beat the final boss. Time to stop feeling my gut churn when I think about my own face. Bring on the uncanny valley and the twitching, broken animations. My actions matter a hell of a lot more than my looks and I’m the only one who agonises over it, anyway. That weird feeling when your favourite character in a game looks a hell of a lot like your own customized character….. eerie but kinda cool.